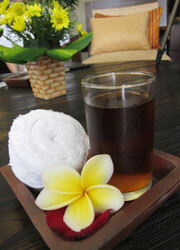 Bali Spa It is only 5 minutes by car from hot spots in Seminyak! 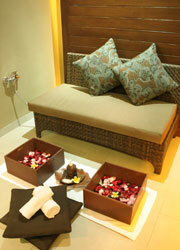 Now, new 3 storied building spa "Banjar Spa" is open on Raya Kuta Street after you turn on Sunset Road. The total number of the treatment room is 123! Each room has a bathtub, a shower and a toilet, so you will feel having a treatment in a hotel room! Special Room for Couple! Rama Sinta! For Couple Treatment! 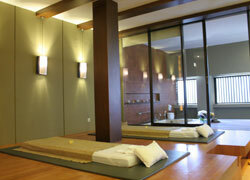 This treatment room has woody floor that make you feel Japanese style bed. The treatment room has bath tab, shower and bathroom. Rama Sinta Room can use by Free Request. Please let us know when you booking. 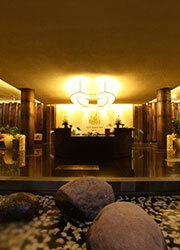 A combination of traditional and long stroke massages resets a balance between mind and body. Warmed stone massage is effect for improve blood circulation and sften muscle. Put stone at energy point that making relax for a nerve and balancing. Mud treatment is now as known as a detox effect. Applying melted mud on a whole body and wrapping it by a heat blanket to improve perspiration and metabolism help slimming up your body! It is recommended especially for improving a whiting effect and nutritional supplementation. It smooth up and make your skin softer. Please choose scrub floowing below. At the beginning, they clean up skins to provide an effect of the mask to the inner part of the skin. The treatment also has a slimming effect. This red wine treatment with 30 kinds of Vitamins and known to decrease a risk of cancer has detox and rejuvenation effects. Booking by 2 people: Free transportation: Uluwatu, Benoa, Nusa Dua, Jimbaran, Kuta, Legian, Seminyak, Sanur and the airport. Ubud, Canggu and Tanah Lot areas needs additional Rp.100,000/car for both ways. Booking by 1 person: Free transportation; Kuta, Legian, Seminyak. Rp.100,000/car for both ways: Uluwatu, Benoa, Nusa Dua, Jimbaran, Sanur and the airport. Ubud, Canggu and Tanah Lot areas needs additional Rp.200,000/car for both ways. Children can wait in the treatment rooms. Menus for children over age 12 are available. All the menus includes welcome drink. It was a lymphatic massage so I wonder if that painful? But it was not painful, I felt great. I thought that the therapist in charge was professional. I think my chronic shoulder stiffness can be relieved with this massage.